Luring mice is not easy. They are very cunning creatures when compared to their size. However, if you are patient and thorough, you will get rid of them quickly. And the main and most important part is to get a good lure. If you lure them to a trap, you are as good as done. If you want to learn how to lure a mouse, read on. Before moving on, I should disclose some facts which you have to know before setting your trap. You can trap a mouse in many different ways. 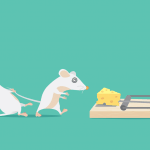 There are many types of mouse traps in the market.Using traps is the most effective one. Traps come in various shapes and sizes. So feel free to read through some facts and tips about trapping mice. If you opt for the kill traps, you can buy either the glue, electronic or snap back trap. On the other hand, if you want to keep the mouse alive, you can use humane mouse traps. They are proven to be more effective because they’re reusable and the mice are more likely to enter them again due to no smell of death. You could also make a mouse trap on your own.The homemade trap is the cheaper option and more family friendly. Bait is an essential part of a trap. It’s how the trap is able to work properly and so placing the bait correctly is a very important step. Get familiar with what kind of bait mice like. It’s no secret they like cheese, but did you know they also love hazelnuts, chocolate, and peanut butter? All of these foods have two things in common: they’re high in protein and fragrant. When applying the bait, make sure to use just the right amount. Using too little won’t attract any mice, and using too much may trigger the trap. This will make it easy for the mouse to run away with your bait. Finally, remember to use gloves when handling bait. You wouldn’t want to leave your scent on it and spoil it that way. Don’t overlook proper trap placement. You should look for dark corners and walls. This is where the mice are most likely to pass. Also, it’s helpful if you identify the areas of rodent activity and place the traps there. You will find these areas easily: there will be droppings, chewed food packages and chewed wires. When placing the traps next to the walls, make sure the bait or the holes of the traps are nearest to the wall. This increases the chances of the mouse smelling them. Make sure to place many traps, several feet apart because this will enhance your chances of catching a mouse. Once you’ve trapped the mouse and successfully gotten rid of it, it’s time to make sure no more mice return to your home. You can do this by getting a pair of later, rubber, or vinyl gloves and a surgeon mask. Once you’ve put these on, thoroughly scrub down your entire home. Use detergent and warm water, pick up all the droppings, dust, vacuum.A clean house is essential if you don’t want any more mice. This eliminates their smell, so other mice won’t feel tempted to go to your home. You could make sure there are no other mice in your home with other repellants, too. Don’t touch anything until you’ve cleaned it, then clean your equipment, and finally clean yourself.This will ensure there are no dangerous bacteria and viruses in the area.Don’t forget to air out the house, too. 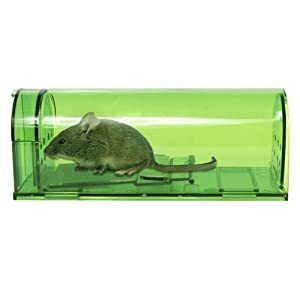 If you’ve opted for the humane traps, it means that you have to release the mouse into the wild after you’ve captured it. If you catch a mouse with a store bought the trap, it means that the trap will serve as a small cage or container. You can use this to carry the mouse. If you’ve caught it in a bucket or thanks to any other home method, chances are you’ll need to transfer it to a smaller container for transport.Drive out far away from your home. You can’t release the mouse in your backyard or neighborhood area. This is because it will find its way back to either your or your neighbor’s home. Driving away for 5 or more miles will prevent it from coming back. Release it into a woody area where it will have room to explore and hide. You can also leave food out for it for the first few days if you want. The answer to the question “what happens after I’ve caught the mouse?” is the disposal of the same mouse. This occurs in an event that you’ve used a regular trap which killed the mouse. Disposal differs depending on what kind of trap you’ve used. If you’ve used a glue trap, simply throw the mouse into the trash with the trap. You can do the same if you’ve used a wooden trap, too, or you can just raise the kill bar and reuse the trap. 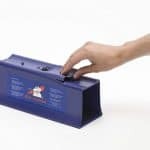 Electronic mouse traps let you just open the lid and empty the trap into the trash, without seeing or touching the mouse. If you’ve found a dead mouse in your house, get some gloves and pick it up, then put it in a trash bag. Seal the bag, then put it in another bag. Throw both of these away immediately. 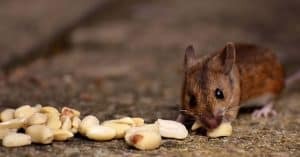 Having read the article, you should know feel more confident about catching that pesky little mouse in your home. If you follow the provided tips and steps, you’re bound to make fast progress. Good luck and remember that patience and determination are the keys to a mouse free home! Mouse lures are essential. You need to lure them properly, or you won’t do anything. Even the most expensive and high tech of traps will be useless. A good lure goes a long way. Placing it improperly will make things rather difficult.